Brooklyn Bedding Spartan Mattress Review - A Good Option For Athletes? 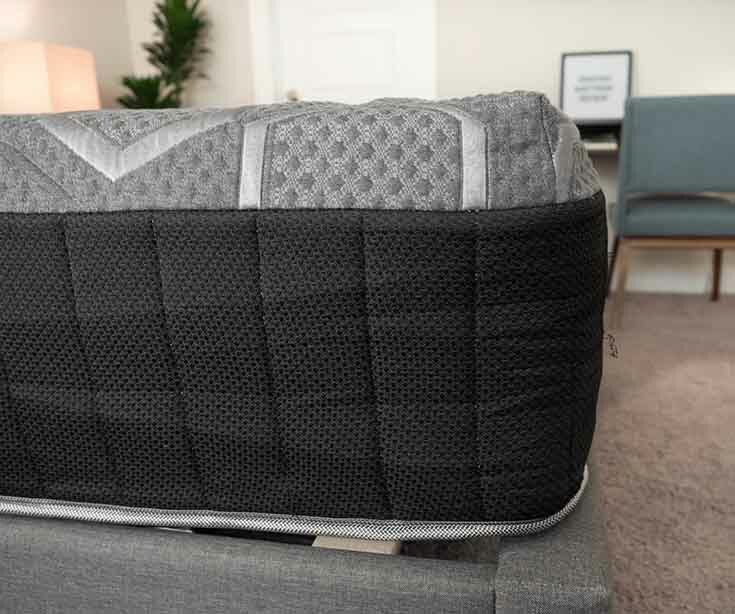 Home » Brooklyn Bedding Spartan Mattress Review – A Good Option For Athletes? Brooklyn Bedding Spartan Mattress Review – A Good Option For Athletes? Over the last few years, I have tried all of the Brooklyn Bedding mattresses, and I have been very impressed with their quality and value. So when I received the new Brooklyn Bedding Spartan, I was very excited to try it out. It is designed with athletes in mind and features Nanobionic technology, which is meant to help with muscle recovery. There are three firmness options: Soft, Medium, and Firm. I received the Medium model. Will this mattress give you the rest and recovery you need? Read on for my full review. You are a side sleeper. This softer mattress offers great pressure relief, so this could be a good choice if you sleep primarily on your side. You sink in and feel that pressure melt away. Even if you are a heavier person, the thick comfort layer should ensure you don’t bottom out. You prefer a balanced feel. This mattress is pressure-relieving, but it is also very responsive. You shouldn’t feel stuck in this mattress because of its nice bounce. You will sink in, but you shouldn’t have trouble moving around. You are an athlete. If you are an athlete, this mattress is made specifically for you. The cover is designed to help with muscle recovery. If you need a mattress to get you recovered and ready to go again, the Spartan could work for you. You prefer a medium-firm or firm mattress. This mattress is softer than average. If you prefer some more firmness or need extra support, this might not be the best mattress for you. You are a back or stomach sleeper. This is not a very supportive mattress, so if you sleep primarily on your stomach or back, you might sink too far into the mattress. You might want to look for a firmer mattress if you sleep in these positions. You like to sleep on top of your mattress. The Spartan is softer, and it does allow you to sink in quite a bit. If you prefer to sleep on top of your mattress (rather than feeling like you’re sleeping “in” it), the Spartan probably won’t work for you. The mattress is 13.5” tall. The cover is woven with performance fabric and Nanobionic technology. The first layer is 1.5” of CopperGel Energex Foam. Next, there are 2” of hyper-elastic TitanFlex Foam. This is followed by a 1” transition layer of Swirl Visco-Elastic Memory Foam. Then, there are 8” of individually wrapped coils. Finally, there is a 1” high-density foam base. The Spartan is available in Twin, Twin XL, Full, Queen, King, and California King. You can choose from three firmness options: Soft, Medium, or Firm. The cover contains Nanobiotic technology. It turns your body heat into energy waves which are redirected toward your body. These waves, in turn, purportedly help your body recover more quickly after a workout. The Energex and TitanFlex foams make up a thick comfort layer, but this layer is also very responsive. You should feel good pressure relief without getting stuck. This should be a cool sleeping mattress. The coils allow for good airflow, while the cover and top foam layers are designed to dissipate heat. You shouldn’t be sleeping hot on the Spartan. The high-quality foams also make this a durable mattress. This should be a long-lasting mattress. In terms of firmness, I thought the Spartan felt like a 5.5/10, or slightly softer than average. It has a thick, soft comfort layer and then a firm support layer. Together, these give the mattress a softer-than-average firmness. When I am on my back, I think this mattress is a bit too soft for me. Medium-firm mattresses are usually best for back sleeping, and the Spartan doesn’t give me quite enough support. My hips sink in too far. When I am side sleeping, the mattress feels the best for me. I sink in and feel almost no pressure on my shoulders and hips. Again, the comfort layer is very thick, so even heavier people shouldn’t have an issue bottoming out the Spartan. When I am on my stomach, I do need more support. I bow in at the hips, and I don’t feel properly supported overall. I would suggest taking a look at the Spartan Firm model if you’re a stomach sleeper. The mattress has a balanced feel overall. It has a good amount of bounce, and the Energex Foam is very responsive. The Spartan is pressure-relieving, but you shouldn’t feel stuck. You will sink in quite a bit, but it shouldn’t be difficult to move around. While the mattress is fairly soft, it is not the best when it comes to handling motion transfer. When I pushed into the area surrounding a glass of water, the water was disturbed a good bit. I also asked Marten to move around on the other side of the mattress while I was lying down. I felt his movements on my side of the bed. Overall, if you sleep with a partner, you might feel them moving around on the other side of the bed. While I still think this could be a decent option for couples, this is worth noting. While I’m sitting on the edge of the Spartan, it compresses very easily. That soft comfort layer gives way quickly, and I don’t feel very secure sitting near the edge. Also, when I lie down near the edge of this mattress, I do feel like I might roll off or be ejected from the mattress. You can see the Spartan’s edge support in the photo below. For me, the mattress felt like a 6/10 in terms of firmness, softer than average. On my back, I’m getting okay support. However, my hips sink in too far, so I could use more support. On my side, I feel great pressure relief. I’m feeling almost no pressure on my shoulders and hips. When I’m on my stomach, I definitely need more support. If you are a heavier back sleeper, this could work, but if you are larger than I am, you might need something firmer. If you are my size and a side sleeper, this could work for you. If you are a heavier stomach sleeper, this is probably too soft for you. Marten’s experience confirms that the Spartan could be a good pick for side sleepers of many sizes. The thick comfort layer ensured he didn’t sink in too far and bottom out. This allowed him to get the pressure relief he needed, even as a larger person. This could be a great mattress for athletes. It includes technology to help you recover quickly. It should be a cooler sleeping mattress. The coils, top foam layers, and cover should ensure that you don’t overheat. The Spartan should be a great pick for side sleepers. It has a thick comfort layer, so even if you are larger, you should feel good pressure relief. The comfort layer is soft but very responsive. You should get pressure relief without feeling stuck. The Spartan is a bed-in-a-box mattress, which means it will come compressed and be shipped straight to you. You will want to begin by removing the rolled up Spartan mattress from its box. Then, preferably with another person’s assistance, position the roll on your bed. Carefully cut away the first layers of plastic until the still-compact mattress can be laid down flat. Then, pierce through the final layer of plastic and the Spartan will expand. Simply clear away the excess plastic and allow your mattress to breathe and fully expand. In the end, I was impressed with the Spartan. It is a good addition to Brooklyn Bedding’s line of quality mattresses. If you are an athlete, you sleep on your side, and/or you like a mattress with a balanced feel, this could be a good choice. If you are a back or stomach sleeper, I would take a look at the Spartan Firm model. The Spartan comes with free shipping and returns, a 120-night sleep trial, and a 10-year warranty. Financing is also available. Hi, I have had a terrible time finding a mattress that does not sleep hot. We just had to return the second Saatva/Zenhaven all-latex mattress, both of which got deep body indentations within three months and slept hot, hot, hot. I also tried the Indigo mattress, the hottest sleep ever. I wonder if copper is a good option, but I hate sinking deep into the mattress. Can you recommend an option? I’ve spent hours researching them all but it’s so confusing and I’m tired of going through this again and again. Thanks for any help! What about the Purple? It’s completely temperature neutral.